In December of 2017 we welcomed Marley into our training program. 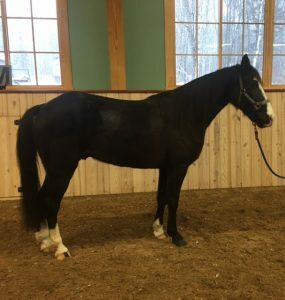 This 3 year old Tennessee Walker stands about 15 hh and comes to us through a new partnership with the Maine State Society for the Protection of Animals (MSSPA) in Windham, Maine. Marley had been with the MSSPA since he was about 9 months old. He has nice ground manners and a very friendly and curious personality. Marley stand quietly for vet, farrier and dentist, worked through all of our obstacles with ease and has recently been started under saddle. Marley does a running walk or pace with a rider, and so far seems to especially enjoy going out on the trails. Currently we are working on steering and steadiness in his gaits while being ridden. Upon completion of his initial training, Marley will be available for adoption through the MSSPA- click here for a few more summertime photos of this sweet boy. Update: Marley found his forever home in May 2018. He will be staying here in Maine with a lovely couple who look forward to building a lifelong partnership. 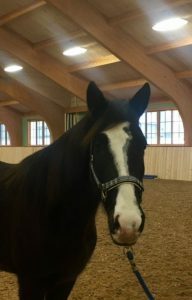 In addition to pleasure rides with his new mom, Marley will be enjoying his time with a 17.1 h Percheron who was in need of a pal. We're thrilled for Marley and wish he and his new family many happy years together!